Well, we're almost done with the alphabet. Today we'll deal with the second-to-last of the 22 letters of the Hebrew alphabet - shin / sin. The name of the letter derives from the early shape - that of a tooth or teeth, as in the Hebrew word for tooth - shen שן (Steinberg adds that the sound is also made by using the teeth). According to Klein, the word shen derives from the root שנן - "to sharpen". There are exceptions to the rule according to which Arabic sh corresponds to Hebrew sin and vice versa. These exceptions are due mainly to assimilation, partly also to the circumstance that Hebrew sin sometimes stands for original samech (see שכך, שבר, שתם). In earlier Aramaic, and Biblical Aramaic sin is generally preserved, but many words that have sin in Biblical Hebrew are regularly spelled with samech in Medieval Hebrew. 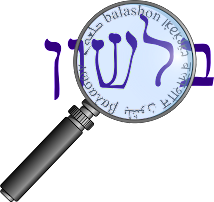 Two different sounds are represented by the Hebrew letter shin. One is originally and really shin; the other is a "th" sound that coalesced into shin in Hebrew. Scholars write this second sound ת. He then gives a number of examples where shin becomes tav in Aramaic: שור / תור , פשר / פתר, שנים / תנים. All of these, according to Horowitz, can be proved by examples where only one of the pair gets a tav in Aramaic (or Ugaritic). In Greek there was no "sh" sound, so many proper names were translated with "s": Moshe / Moses, Shlomo / Solomon, Shmuel / Samuel. The letter shin as a prefix (she-) means "that". The full word for "that" is asher אשר. Eliyahu Netanel here discusses which came first - she- or asher? He believes that she- came first, with an alef and resh added on later. As you may have noticed, I have added a new section to the sidebar - "My Bookshelf". While this does not include every book I own, or even every book I use for this blog, it has the main sources I use for research here. The links are actually blog posts - so feel free to leave questions or comments about the books. I am also going to add here a list of books I don't have - yet. I will add to the list any time I come up with a new resource I'm lacking, and hopefully remove from the list when I acquire new (or used) books.